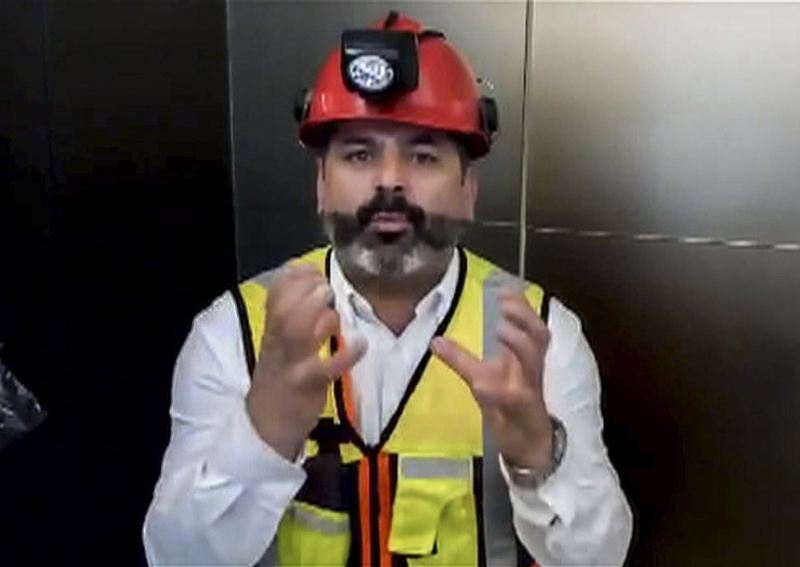 MEXICO CITY - Mario Sepulveda, one of the Chilean miners who was trapped underground for 69 days in 2010, had a moving message of encouragement Wednesday (July 4) for the boys' football team trapped in a cave in Thailand: "Hang in there!" In a video message sent to AFP, Sepulveda - known as "Super Mario" for helping keep his comrades' spirits up during their ordeal - said his thoughts were with the 12 boys and their coach, so much so that he is trying to organise a trip to Thailand to help. The mission to rescue the football team from their flooded cave has resurrected memories of the Chilean mining accident eight years ago. Then, the world held its breath as Sepulveda and 32 others survived nearly 10 weeks underground before finally being hauled to the surface one by one. Dressed in a yellow vest, orange miner's helmet and headlamp, Sepulveda sent a brief but energetic message to the members of the Wild Boar football team in a 40-second video. "Mucha fuerza!" he told them - which roughly translates as "Hang in there" or "Much strength." "I'm going to see what's possible. I'm calling someone from the (Chilean) government to try to get some money together. I think it's important as a country for us to be there, after what we miners went through," he told AFP during a visit to Mexico City. "I would love to go. I think it would be extremely important to support the families, give them a hug. Words of encouragement are important." Also read: Thailand cave rescue: What now for the boys? The trapped boys, who range in age from 11 to 16, were exploring the cave with their coach 11 days ago after football training when rising flood waters trapped them inside. British divers found them on Monday night, huddling on a muddy ledge above surging underground waters, more than 4km inside one of the country's longest caves. A new video on Wednesday showed them in good spirits. A massive international rescue operation is exploring the options to get them out, none of them simple - just like in the case of the miners trapped in 2010. "I don't have the slightest doubt that if the (Thai) government give it everything they have and make every humanly possible effort, the rescue will be a success," said Sepulveda, a gregarious dynamo who speaks in a swirling torrent of words. Rescuers say there are three main options to extract the boys: diving out of the cave system, exiting through another hole if one can be found - or drilled - or waiting out the monsoon season underground. Diving out is risky, since the boys have never dived before and some may not be able to swim. Sepulveda urged the authorities to waste no time and spare no expense. "What we need here is for the Thai government to put in a lot of money, and whoever else wants to donate, and get professional divers in there to get those boys out now," he said. "They need to teach them to dive as quickly as possible." Sepulveda, 47, was one of the leaders of the miners trapped underground at the San Jose copper and gold mine in northern Chile's Atacama desert. Today, the married father of two has reinvented himself as a motivational speaker. He was portrayed by Spanish heartthrob Antonio Banderas in the 2015 film about the miners' ordeal, "The 33".